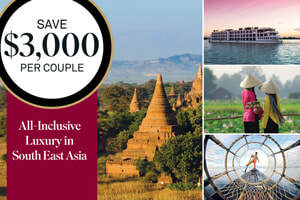 All-Inclusive Luxury on Scenic Cruises - Fugazi Travel Agency Inc.
South East Asia is a treasure trove of culture and color, and the Mekong & Irrawaddy Rivers offer a unique vantage point from which to soak up the ancient sights. Between the rice paddies of the Mekong Delta and the elegant Colonial-era architecture of Yangon, a mixture of magical temples, wild forests, time-honored cultures and bustling cities scatter the tapestry of the landscape. Book now and save $3,000 per couple! Suites are limited, so don't delay. Call our Fugazi Travel today at (800) 544-8728 and begin planning your journey to vibrant South East Asia. Book now and save $3,000 per couple! Suites are limited, so don't delay. Call Fugazi Travel today at (800) 544-8728 and begin planning your journey to vibrant South East Asia. Terms & conditions: Prices are in U.S. dollars and available to legal residents of the 50 United States of America only. Offer valid through June 30, 2018 on new bookings only. Scenic Savings offer is $1,500 per person. Pricing is per person, in U.S. dollars, based on double occupancy and the savings amount is reflected in the pricing. A non-refundable deposit of $500 per person is required at the time of booking, with full payment required 90 days prior to departure. Offer may be extended, canceled or withdrawn at any time without notice. For full terms and conditions visit scenicusa.com. Offer is not combinable with any other offer except for past passenger, referral and travel show vouchers. Offer applicable for legal residents of the 50 United States of America.